Spiral bound Message Log Book helps you keep an accurate record of messages retrieved from your voice mail system or answering machine. No more lost scraps of paper or notes scribbled on the back of business cards. Each page contains four messages. 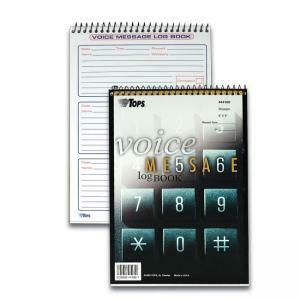 Each form includes spaces for date, time, name, company, phone number and notes. The message form also has easy check-off boxes which indicate if the call has been returned. Heavyweight white bond sheet allow no bleed-through from the previous page. Spiral bound book with coil lock ends allows the cover to flip back for easy writing. The book lies flat. Wire ends won't snag clothes or scratch desktops. Perfect for the office or on the road.